Following the sad news that a Agera RS had crashed undergoing shakedown testing last week, Koenigsegg – being the class act that it is – today revealed that it will be replace the car with a new model. The Swedish carmaker also revealed that the car was indeed the Agera RS Gryphon that debuted in Geneva back in March, destined for Manny Khoshbin, a man with seriously good taste in cars. The supercar collector and Koenigsegg have apparently reached an agreement regarding the car. 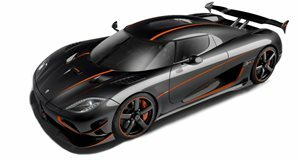 On its Instragram page, Koenigsegg said that: “The car known as the Agera RS Gryphon will be repaired and become a Koenigsegg demo vehicle. More importantly, work has already begun with @mannykhoshbin to spec an all-new Agera RS that will blow everyone's mind. We would like to thank @mannykhoshbin and the wider Koenigsegg family for their understanding and support.” There’s no word on how long it will take to replace the retired Agera RS and whether its owner intends to do something even more extreme than add gold lead detailing, but from what we’ve seen of his previous cars – including this chameleon carbon-fiber McLaren P1 and Hermes orange Pagani Huayra – we can’t imagine it will be anything less than outrageous.